Kuroko is an interesting character. His play mainly consists of dishing out assists to help his teammates score points because he lacks the abilities to do it himself. For a basketball fanatic, this would seem to be nothing out of the ordinary, but there’s a catch: Kuroko has very little presence and uses misdirection to take the opponent’s attention away from him. Thanks to those, he became known as the phantom sixth man of Teikou, as the invisible regular who excels in passing. 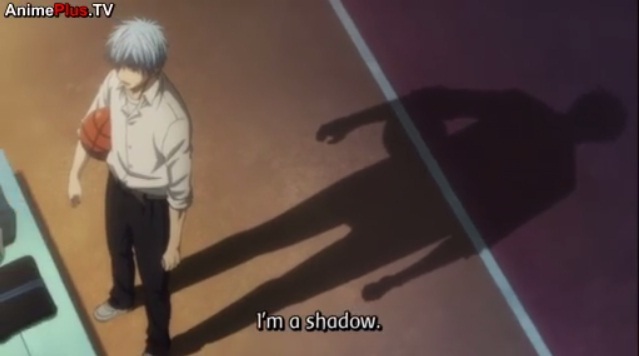 Like Slam Dunk’s Sakuragi Hanamichi, he takes on a supporting role, and refers to himself as a shadow that makes the “light” brighter. 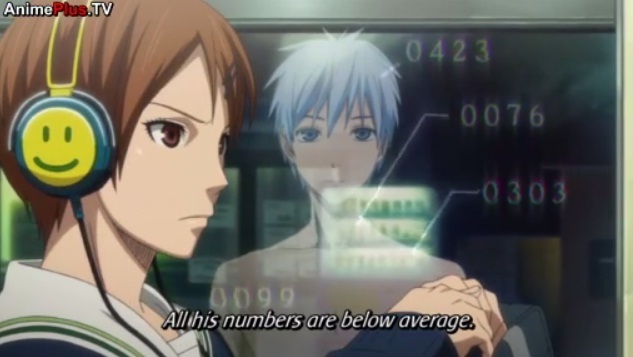 The first half of the first season convinces us that the way Kuroko plays is special and promising. Essentially, the core principle of his basketball is teamwork, the most important thing in a team sport. This point is underscored upon the appearance of his former teammates, Kise Ryota and Midorima Shintaro. He and his light, Kagami Taiga, would work together and take down the first two of the Generation of Miracles. As such, they think that going to Seirin is a waste of Kuroko’s talent because it is a team that could not fully utilize him. But Seirin wins anyway, so they don’t say anything more after that. Kuroko’s character development would begin upon the introduction of his former light Aomine Daiki, the ace of the Generation of Miracles. 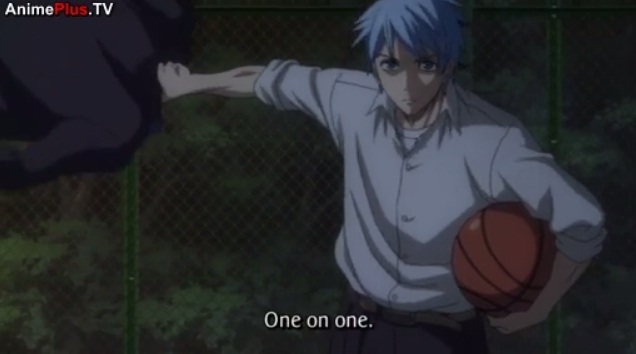 Unlike the other two, Aomine defeats Seirin lopsidedly and denies the very way that Kuroko plays basketball. I find this to be very similar to the “ninja way” referred to in Naruto. Basically, it is inevitable that Kuroko will eventually lose if he keeps playing on his current level, while everyone else keeps on improving. 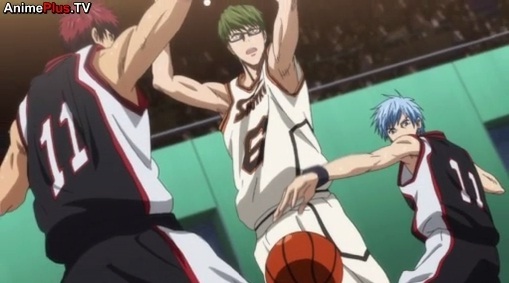 The Touou vs Seirin match only proves that teamwork can only go so far against an overwhelmingly talented opponent. This actually reminds me of Momoshiro and Echizen’s doubles match in TeniPuri. The opponents are obviously more skilled and experienced in doubles than both of them, but they still win in the end because they are simply stronger as individuals. But instead of developing his potential in other areas in basketball (because it’s a sport for those who are able to do everything like Kiyoshi said), Kuroko’s growth as a player is stunted because Teikou groomed him to be the key to playing basketball with five individual strengths other than five people working together as a team. Therefore, Kuroko’s basketball is a style that does not allow him to grow as an individual. Riko falls into the trap of using Kuroko like Teikou used him, because she too had set his limits for him instead of helping him overcome them. She doesn’t even help him cure his stamina problem and is contented in just benching him for a full quarter to save his energy. I’d go as far as to say that as a coach, she has let him down. Personally, I agree with him. I’m no basketball expert, and this is simply out of pure belief in Kuroko’s potential, but I think it’s wrong to think that passing is the only thing Kuroko can do. Passing is a fundamental skill in basketball, but rather than being a pure skill, it is a set of skills. To excel in passing, you need to have good aim, good hand-eye coordination, and quick decision-making ability required of a playmaker. If you have good aim and good hand-eye coordination, there’s no way you won’t be able to shoot a ball. 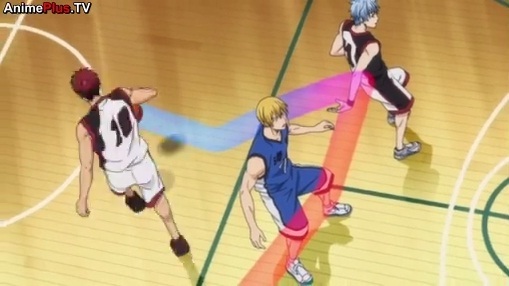 It’s just that Kuroko does not have a polished shooting form. At the end of the first season, Kuroko seems to be headed in the right direction, thanks to his teammates. 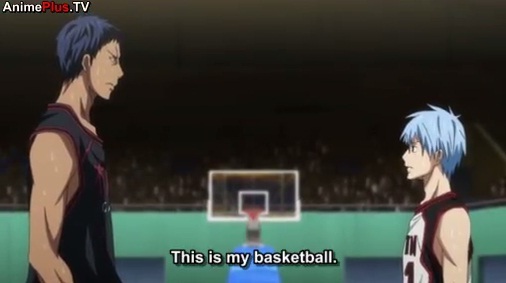 He tells Kagami: “I am not Teikou Middle School’s sixth man, Kuroko Tetsuya. I am Seirin High School first year, Kuroko Tetsuya.” The crucial first step has been taken, and we can only watch the rest of the journey. Posted on May 21, 2013, in Anime Analysis, Uncategorized and tagged DO PEOPLE EVEN CARE ABOUT THIS SHOW ANYMORE, froggy is a fujoshi on the inside, kuroko, kuroko no basuke, man i'm so deep. Bookmark the permalink. 4 Comments. You bring up a good point about Kuroko no Basuke being about Kuroko’s development as a character. Despite the story being about everyone growing together as a team, it’s Kuroko’s development and his fascinating backstory that seems to overshadow Seirin’s story at times. Also, I’m struck by the comparison between KnB and Prince of Tennis. It just goes to show just how different the tone of a story can be when you have different lead characters. Though, really, the idea of arrogant genius is shown pretty clearly in both series, come to think of it. The Generation of Miracles is basically Ryoma’s character taken to its logical conclusion. Given how unpleasant of an MC Ryoma always was, no wonder Kuroko wanted to get out of Teikou! Hahaha, jokes aside, nice post. This makes me really look forward to the second season! The huge difference between the protagonists spelled much of the difference between KnB and PoT. PoT will always be close to my heart after writing for it for so long, but Ryoma is a flat character to be blunt about it. He’s the super rookie all throughout, and the Muga thing at the end doesn’t really count as a character development for me because he just keeps pwning anyone anyway. The story’s not really about him, and well, as I said, KnB is all about Kuroko. Big difference right there. The second season’s going to be really good, what with the recent developments in the manga and all. I agree that in Teiko he was so used to being only a passer that he never really bothered with any other skills. I follow the manga but this wait for the 2nd season is driving me nuts.